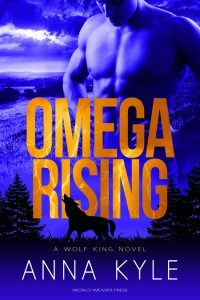 I’m so excited to be part of the Omega Rising Blog Tour for Anna Kyle! She was kind enough to write an amazing guest post for my blog. Check it out, and then go buy her book! 1 It gets easier. Um, no. Writing a book is freaking hard – every time. At least for me. I think you get more proficient as a writer but creating a good novel, coming up with compelling characters and plots and subplots and twists that surprise a reader is not easy. Maybe after book five or six or seven it gets easier. I don’t know. When I write my seventh book (fingers crossed) I can let you know. The hard work is definitely worth it, though. 2 You need to write every day to be an author. Okay, that one is good advice but I can’t and don’t follow it. It’s and unrealistic goal and puts undue pressure on aspiring authors, especially when they’re starting out. Most writers deal with jobs, families, responsibilities, illnesses, errands, cooking (jk I barely cook). I write a lot, don’t get me wrong, but not every day. 3 Writers must write. This one bugs me. What happens if we stop for a day, a week, a month, a year? Do we explode from all that unreleased idea-energy? Do we lose our imagination? C’mon. Writers are simply creative humans who truly enjoy writing; it’s incredibly thrilling and rewarding to see stories from our head transformed into words on a page. 4 Once your manuscript is published, you’re done so write your next book. Yes and no. Yes you should be in the midst of your next book and no you’re not done with this one. Because now you must get the word out that your book exists in a sea of millions of other books. That is not easy. I’m lucky that I have an amazing publisher (shout out to the World Weaver Press team) and an equally amazing editor (*blows kisses to Cori Vidae*) behind me doing some heavy lifting but as an author you also shoulder a responsibility to make your book a success. If you are self-publishing, all that work is on you so be ready. Have a plan. Omega Rising is available in trade paperback and ebook via Amazon.com, Barnesandnoble.com, Books-a- Million, Kobo, World Weaver Press, iBookstore, IndieBound and OmniLit, and for wholesale through Ingram. Cover Reveal for —- Killer Potential!